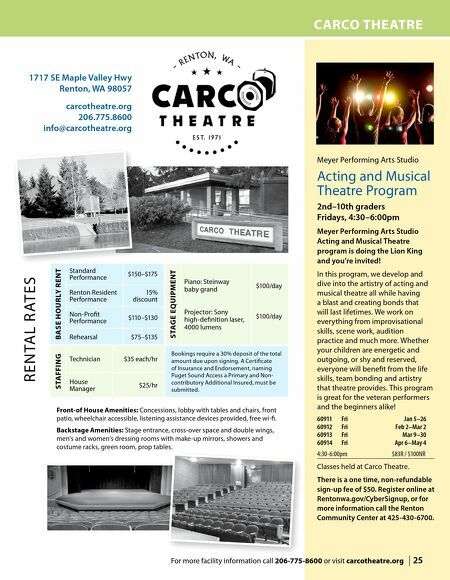 For more facility information call 206-775-8600 or visit carcotheatre.org | 25 CARCO THEATRE 1717 SE Maple Valley Hwy Renton, WA 98057 carcotheatre.org 206.775.8600 info@carcotheatre.org RENTAL R ATES BASE HOURLY RENT Standard Performance $150–$175 STAGE EQUIPMENT Piano: Steinway baby grand Projector: Sony high-definition laser, 4000 lumens $100/day $100/day Renton Resident Performance 15% discount Non-Profit Performance $110–$130 Rehearsal $75–$135 STAFFING Technician $35 each/hr Bookings require a 30% deposit of the total amount due upon signing. A Certificate of Insurance and Endorsement, naming Puget Sound Access a Primary and Non- contributory Additional Insured, must be submitted. House Manager $25/hr Front-of House Amenities: Concessions, lobby with tables and chairs, front patio, wheelchair accessible, listening assistance devices provided, free wi-fi. Backstage Amenities: Stage entrance, cross-over space and double wings, men's and women's dressing rooms with make-up mirrors, showers and costume racks, green room, prop tables. Meyer Performing Arts Studio Acting and Musical Theatre Program 2nd–10th graders Fridays, 4:30–6:00pm Meyer Performing Arts Studio Acting and Musical Theatre program is doing the Lion King and you're invited! In this program, we develop and dive into the artistry of acting and musical theatre all while having a blast and creating bonds that will last lifetimes. We work on everything from improvisational skills, scene work, audition practice and much more. Whether your children are energetic and outgoing, or shy and reserved, everyone will benefit from the life skills, team bonding and artistry that theatre provides. This program is great for the veteran performers and the beginners alike! 60911 Fri Jan 5–26 60912 Fri Feb 2–Mar 2 60913 Fri Mar 9–30 60914 Fri Apr 6–May 4 4:30-6:00pm $83R / $100NR Classes held at Carco Theatre. There is a one time, non-refundable sign-up fee of $50. 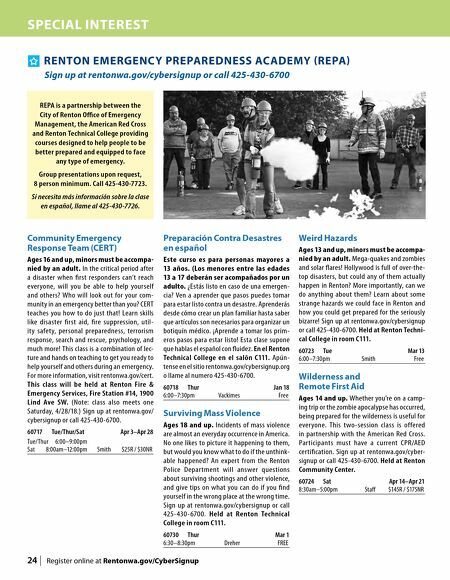 Register online at Rentonwa.gov/CyberSignup, or for more information call the Renton Community Center at 425-430-6700.